There are many advantages to using manual flash control as opposed to E-TTL. The biggest advantage would be consistency. With manual flash, the only time that power setting is going to change is when you push that button yourself, or if you run out of battery power...(derp [Rule #1. Always bring spare batteries]). The next big advantage to using manual flash is the learning experience. If you are new to flash photography, going full manual will force you to know what flash power gets you the right exposure. You can't rely on your camera to do all the thinking for you. This is a good thing!! In the age of digital photography we rely too much on the auto features the camera possesses and don't know the basics anymore. In the long run and the short run, knowing how and WHY you got a certain exposure or photo will pay off. - New hot-shoe mounting system! Now with pin locking system like on Canon Speedlights and rubber water sealing gasket. - Can now change the power in 1/3 increments and very easily by just tapping the up or down buttons. So simple! - power settings from 1/128th to Full (1/1) Power, and can wrap around from bottom to top easily. - Multiple ways to connect the flash, power supply, or firmware updates, pc port. - Thermal cut off sensor, when flash gets too hot it will slow down recycle time. This flash is honest to goodness built like a tank. I could most likely throw it at the wall and it would survive [no plans to do this]. What this does provide though is peace of mind that you don't have to be dainty with this flash, you can take it anywhere, it will withstand a beating. It's not going to die on you out on a shoot. And it has a killer warranty! Which brings me to the next point. 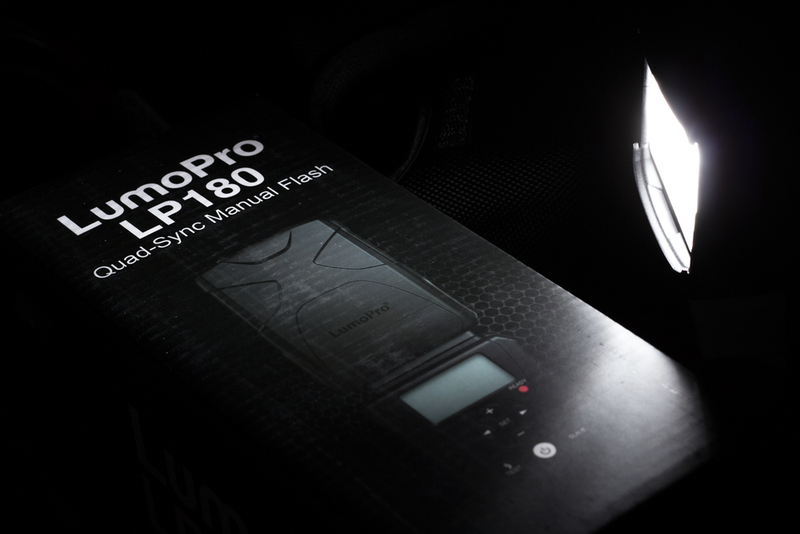 If you can believe it, LumoPro is providing a a killer 2 year warranty with every LP180 flash unit. This is double what Canon offers with its speedlites. The LP180 has great flash power, and produces power that of the top of the line Canon and Nikon Flashes. Actually it is a bit more powerful. You can now adjust the power output in 1/3 stop increments. As for the recycle time, at full power, with NiMH batteries, I've been getting a really fast recycle time, close to 2 seconds. And on anything lower then that its really under a second. You can rapid fire at 1/128th and I'm loving it! As it would lead you to believe by the name Quad Sync, you have 4 ways to sync with the LP180. The first is hot shoe, which can now be locked like a Canon speedlite. The second being optical slave, third pc jack, and fourth 1/8th mono plug. I prefer to sync mine via radio triggers such as Pocketwizard Plus X's. But the optical slave works fantastic too, but setting the slave to Slave number 1-10 to combat with pre flash from TTL systems. I love that they have included a threaded PC sync port on this little guy. You never know what you're going to encounter when taking this thing on location or even in the studio. You might have some klutz running around or a fair bit of wind and your light stand just takes a tumble, or something gets snagged on your pocket wizard during a shoot. The last thing you want is that cord being yanked out of the flash! Or consider this scenario, you have this flash up in the rafters of a tall building and the Pocketwizard disconnects because its not threaded... now you have to waste all that time to climb up there and reconnect it. Just a good thought. Another good thing about the 4 connection ports is there is a mini USB port for future firmware updates LumoPro will provide, and the high voltage external power supply port. Affordability - This Flash is Super Cheap for the amazing quality! Coming in at only $199 you really can't beat it, especially when it competes directly with the Canon and Nikon Flagship flash models. For the same price as both their top models you can almost buy 3 of these flashes! !Thats absurd! No TTL, but most light perfectionists don't use TTL anyways, or really anyone who's lighting off camera. So go manual with it, really learn what the different power outputs can give you in an image. Build Quality / Quality of Light - This Thing is built like a tank, and the power it outputs is amazing. Again it competes with the flagship models from Canon and Nikon easily. Simplicity - This flash is bare bones, all you need in a lighting set up. Its super intuitive to use, and produces great results. There are 8 buttons total on the dang thing, all with only 1 simple function. No deep layered menus like on the main brand flashes. This flash is worth every penny, and then more. Every strobist out there should have at least 1 if not 2 of these in their kit. You can't beat the build quality, or the quality you're receiving for the price. Honestly i'd pay more money for it if I had to, it's that good. Produces just as much power as the flagship speed lights, the only thing lacking is the confusion of deep layered menus, and TTL which you don't need anyways. Go out and buy one before they're on major backorder! Where can you get one? They are being sold through retailers like Midwest Photo Exchange and other LumoPro retailers. As of writing this article I have sold my Canon 430ex ii and bought another LP180! "The LP180 boasts a guide number of 110, making it equivalent to top-of-the-line models from major flash manufacturers like Nikon and Canon. The reliability and affordability that built the LP160's reputation in the photographic community have been carried over in the LP180 as well. And as always, LumoPro® backs every LP180 with a 2-year international warranty." Guide Number: Every company measures guide number differently. At LumoPro®, this is how we measure guide number: GN= Distance x f/stop, Distance = 10ft, F/stop at 105mm, ISO 100, Full Power = f/11 10ft x f/11 = 110, GN = 110 The LP180's power is roughly equivalent to the Canon Speedlite 600EX-RT or the Nikon SB-900. Built-in Slave Function: S0 (off), S1 (standard optical slave), and S2-1 through S2-10 (pre-flash synchronization optical slave). Hot Shoe: Standard ISO size, center pin contact, mounting foot lock with drop-down locking pin. Power Source: Four 1.5V AA size batteries (Alkaline or rechargable NiMH). NOTE: Do not use Nickel Zinc "NiZn" batteries as they can cause damage to the LP180. Included Accessories: Soft case, flash stand, 3.5mm miniphone to 3.5mm miniphone sync cord. Warranty: 2 years from date of purchase through authorized LumoPro® dealers. The LP180 is fantastic with or without a modifier. I'll show you a few examples of shots with a soft box and then some without. This photo is from a headshot session I did for SC Conners Wealth Management - a financial advisors office. And then this next shot is without any modifier. Just bare flash head. This shot was achieved with a very simple 2 flash set up. one of the flashes was set to the side of my desk on a printer, the other right next to the Apple remote pointed at the ceiling to bounce the flash. And heres the photo of the set up for this shot. The flash on the left is firing at 1/128th power, and the one on the right is at full power. As you can see there's nothing to this shot, EXCEPT 2 amazing flash units!